For long Molecular Diagnostics has been the domain of large central laboratories requiring patients and samples to travel long distances for a test to be conducted. These pose several logistic and technical challenges leading to increased costs and delayed results. The veracity of such results and impact of such intervention in treatment outcome have always been questionable. Doctors focus on infection control, role of surgery to treat tuberculosis. APCON 2018 : Bareilly, U.P. The micro PCR Chips are pre-loaded, ready-to-use and disposable. They are disease-specific and can be run on the Truelab™ Uno Dx/Duo/Quattro to get a quantitative real-time PCR results. Truenat Universal Control Kit is a set of positive and negative control for validating the performance of Truenat chip based micro PCR tests run on the Truelab Real Time micro PCR Analyzers. Truenat HLA-B27 is a chip-based Real Time Polymerase Chain Reaction (PCR) test for the qualitative detection of HLA-B27 in human blood specimen and aids in the diagnosis of HLA-B27 typing. 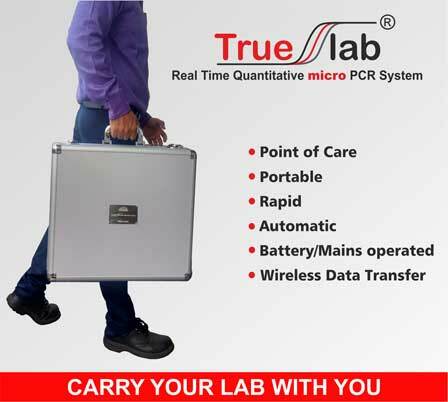 It runs on the Truelab Real Time Quantitative micro PCR Analyzers.